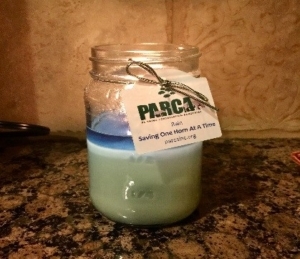 PARCA is having a holiday candle sale! Order by November 10th and delivery will be before the holidays. These 16-ounce soy candles come in a mason jar with a cute PARCA tag and are made in the US. They make your home smell wonderful and make great gifts! They are hand-poured when ordered and burn 90-100 hours on lead-free cotton wicks. Candles are $13 each or 2 for $25. We unfortunately cannot ship them, but if you are near Philadelphia PA, we are happy to make arrangements with you for pick up. Order by emailing us at parcasavesrhinos@gmail.com. We accept PayPal, Venmo, or cash. Comments Off on Holiday Candle Sale!